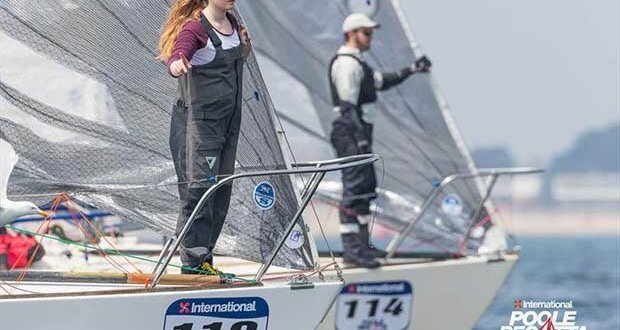 The 2018 J24 UK National Championship was held over the bank holiday weekend of 26th-28th May as part of the International Paint Poole Regatta. With thunder and rain forecast, the regatta weekend looked bleak, but miraculously the sun shone through to bring a very hot and desirable event. With twenty-one entries, the J24 class was the largest fleet in the regatta and as usual, presented extremely close one-design racing. The event attracted a good turnout of boats with two visiting from Ireland as the fleet gets ready for their World Championship at Lake Garda in August 2018. The first day of the regatta started with a moderate easterly breeze which was less than most boats expected, with the majority of the fleet swapping to genoas before the start of the first race. The first three races saw Chaotic and Madeline leading the fleet with two wins to Chaotic. The last race of the day brought with it a right hand shift which allowed the U25 crew aboard Team Impact to capitalise and come through with a dominant win. With Madeline receiving a black flag in the last race, Saturday ended with Chaotic leading the regatta. Sailors woke on Sunday morning to heavy rain, however by rigging time, the clouds had past and once again a day of hot sunny weather was enjoyed, even if the wind was a little light at times. Another four races were held in the light conditions, with several boats finding the pace to finish at the top of the fleet. The Parkstone U25 team once again showed good speed winning the first race of the day, with Mojosi and Danjerous When Wet also scoring bullets. Duncan McCarthy had a consistent day with one win and three 4th place finishes, bringing them up to lead the regatta by four points after the second day, followed by Chaotic. Under-25 team Majic were lying in 3rd place with a set of consistent results with Team Impact U25 only one point behind in 4th. After an early start on Monday morning, the fleet arrived at the race course for a 9am start – but the wind didn’t. Two races were scheduled to conclude the championship series and the fleet waited for three hours for the wind to fill in. Drifting around in no wind got too much for several travelling competitors who took the decision to head back to shore to get an early crane out. At 12pm, seemingly out of nowhere, the wind filled in to allow the race officer to get one race in to conclude the regatta. This saw Madeline and Chaotic locked into a match race battle for the overall win, resulting in Madeline being disqualified from the last race after a protest hearing. The two under-25 teams were also in a close fought match race for 3rd place, but James Torr’s team aboard Majic managed to hold off Giles Kuzyk’s Team Impact until the end. At the front of the fleet, Joe Cross, Mark Lewers and William Pollock secured the top three places in the final race of the event. Congratulations go to Nick Phillips and team on Chaotic who sailed well to become the 2018 National Champions. Duncan McCarthy closely followed in 2nd place and James Torr’s U25 team took 3rd. 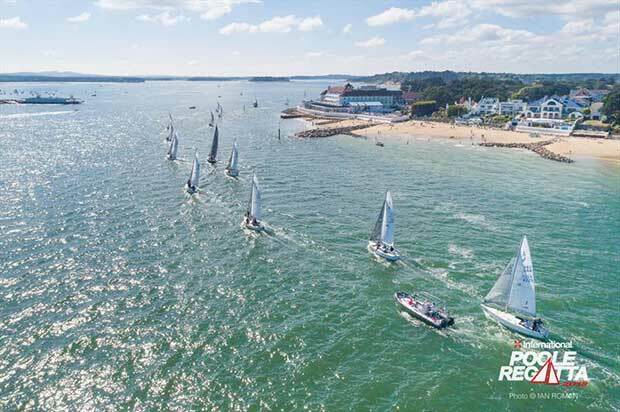 The event saw several new faces to the J24 class who showed great form; many in preparation for the 2020 J24 World Championship which is coming to the UK and being hosted by Parkstone Yacht Club. It’s also great to see two under-25 teams battling near the top of the fleet after being attracted last season by fantastic, affordable, one design racing. This bodes well for the future of the class and any new teams are encouraged and welcomed. The class would like to thank Poole Regatta, Parkstone Yacht Club and our race officer, Bryan Drake with his team of committee boat crew and mark layers for providing excellent racing and courses throughout the event and for their perseverance on the last day of racing.